It has been well established that California Indian peoples continue to be intimately tied to the lands that now make up the state of California. Native peoples have been tending to and caring for every part of this land since time immemorial. Even though many Native peoples are doing much more than hunting and gathering, the most popular designation applied to "ancient" Native societies is "primitive hunter-gatherer." The continued use of designations like “primitive” or “hunter-gatherer” effectively reduces a nation-society-tribe-people to two activities that are practiced in most every society around the globe during the same period of time. The gathering, preparing and making of bark skirts offers a clear example of how misleading the “hunter-gatherer” designation is, as bark skirt construction encompassed botany, horticulture, mathematics, engineering, art, spirituality, and philosophy. The making of these types of items shows that Northwest Coast Native societies were organized around much more than hunting and gathering. Designations like primitive or pre-historic, or hunter-gatherer created and maintained a certain image of Native peoples and their societies. The first written use of the word primitive “in its anthropological sense” was in 1781 during the American War of Independence. Before this, European scholars had designated theories of cultural development (formulated since the early 1750s) that included hunting, pastoral, agricultural, and commercial (Carr, 2). In 1781, Edward Gibbon wrote that the Native American was placed firmly in the hunting category and that these “savages” condition is “perhaps the primitive and universal stage of mankind.” (Carr, 2) Native Americans became tied to the primitive and the designation was adopted as a means to separate Native peoples from “civilization” and the present by placing Native peoples firmly in the past. It seems that the designation of hunter-gatherer rests on the perceived lack of agricultural based practices, specifically as it pertains to the forced domestication of plants. There are, however, a number of key examples of California Indians employing domestication of plants and forms of agriculture. · Wild tobacco was planted and grown by the Digueno, Cahuilla, Wintu, Maidu, Miwok, Yokuts, Panamint, Hupa, Yurok, and Karuk (36). · The Digueno sometimes planted seeds from wild plants or transplanted wild plants to areas where they could be better tended (37). · Cahuilla medicine men cultivated their own special plots of medicinal herbs and tobacco (37). These are just some ways that the Native people of California cultivated and cared for the land as well as their societies. California Indian societies were and are about much more than hunting and gathering. Their interactions with the land, flora and fauna reflect a complex system of agriculture, horticulture and cultivation.Their regalia making is a clear illustration of these relationships. The gathering, construction and use of bark skirts is one such example. Various types of bark skirts are made throughout the California region. Bark skirts are stripped pieces of bark woven and/or tied together to make a utilitarian skirt for wear. They were "everyday" dress for many Northwest coast tribes. Bark skirts became less popular among California Native peoples over the past 200 years. This could be because Native people had adopted different styles of "everyday wear" or could also be because in many areas Native peoples were forbidden from performing traditional and cultural activities like making bark skirts. Wearing bark skirts has become more popular with the revitalization of women's coming of age ceremonies in Northwest California. 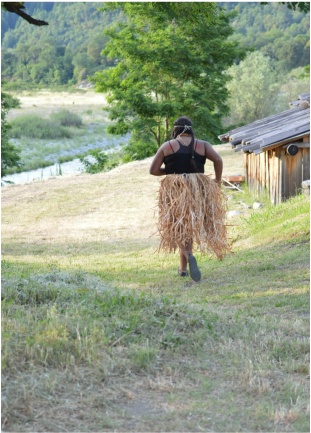 As young women prepare for their dance, they need to make a bark skirt for running, bathing, and doing daily training activities. Today, you can see these bark skirts being worn by women in these coming of age ceremonies, and also as part of demonstrations. They are also becoming more popular for wear in various ceremonies. During the women's coming of age ceremony, young women wear bark skirts when they perform their daily run. Photo printed with permission from Naishian Richards. "Generally, commencing in the spring when the sap begins to run, the bark of the Big Leaf Maple can be stripped from the tree. The outter layer is discarded, but the smooth inner bark can be separated into paper thin layers that can further be torn into thin ribbons which are then assembled into a skirt." After stripping the piece from the trunk, Native people rub dirt on the exposed part of the tree and make an offering of tobacco. This action is about protecting the tree and it's health. Many Native practitioners from Northwest California reflect on how they were taught very early about over-harvesting and to be constantly mindful of how their harvesting affects plants from one year to the next. "...our system of rights brings with it responsibilities. For example, we use to burn as a means to control insect pests, clear slash, and enhance plant growth in ways that support the health of the plant and the needs of the people. Managing a particular area one would be in relationship with the land and all that lives on it. One would know the plants and animals, weather patterns, and other factors that might impact use of resources." This type of knowledge showcases the relationship that Northwest California Native peoples had with their environment. Their harvesting was not only a way for them to provide for their people, but also was important for them to care for and be responsible to the land, plants and animals. Their harvesting and interaction with each plant was also centered on what was best for that plant. The practices interacted with the natural world in a way that promoted a healthy, vibrant ecosystem. This type of careful harvesting may be another reason why the revitalization of making and wearing bark skirts has taken a number of years. As Northwest Coast peoples must be mindful of how and when they harvest, it can take many years to make several skirts. However, as Native peoples continue to pass on this tradition despite the attempts to eradicate this practice, making and wearing a bark skirt once again demonstrates the resilience of Native traditions and culture and showcases how their knowledge of the world around them is still informing sustainability, agricultural and horticultural practices today. “In addition to being a spiritual act integral to Native cultures, gathering physically benefits the affected plant populations. …California Indian land management practices are ecologically sound and even necessary for maintaining the delicate ecosystems across the state” (29-30). 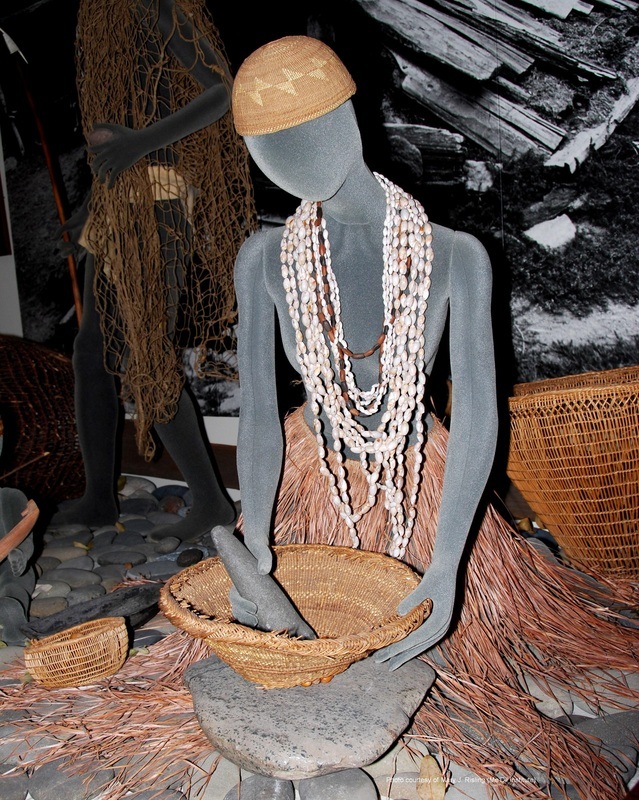 How does hunter-gatherer encompass the “sophisticated horticultural knowledge” that Native Californian people used to manage their land or the world class art, functionality, and quality of hand woven baskets or making regalia or items like bark skirts? Bark skirts and other regalia items show how Native cultures and societies are complex, modern cultures that continue to live on today. Every skirt has a story... click a pic to read more!